We finished our travel to the Seattle area to visit friends with Alice Gale in tow last week. Two weeks and seven opportunities to sail, our last day in Central Oregon was 2 degrees fahrenheit at 3 am and we decided to call it a trip and head on home. We did a marathon road trip of 14 hours and arrived home safely. Alice Gale rides very nicely on her trailer, and happily we had no road damage after 2000 miles of travel. We sailed on seven occasions with winds from 0 to 35. Most days the wind was less then 6 mph. Our last day on the Columbia River included gust up to 35 and it turned out to be a short sail. The sweet spot for Alice Gale appears to be winds between 8 and 12 mph. She is extremely comfortable with these winds speeds and sails wonderfully at I believe to be her hull speed. We are able to tie in a “Cajun tiller tamer” and broad reach with a glass of wine and good conversation while taking in the sites. Under these conditions Alice Gale has exceeded all the expectations I had hoped for when I selected her plans. 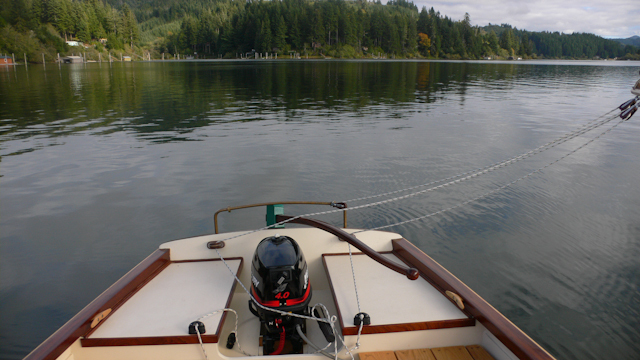 We have learned from this trip that trailer sailing vacations are fun and very rewarding. I have found that Alice Gale generates a lot of interest where ever she sails. 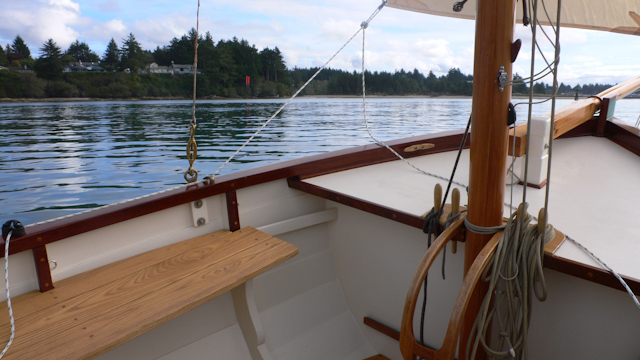 She is great looking under sail and looks good at the dock or on the trailer. 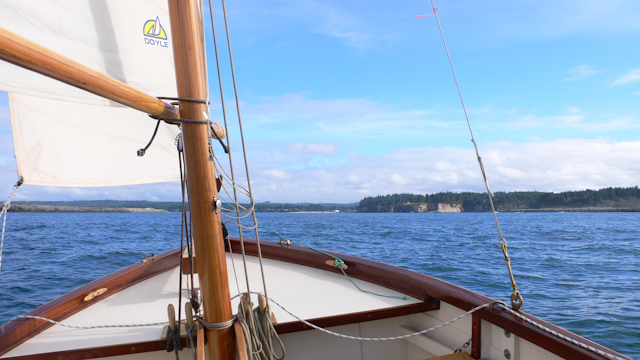 We had a wonderful sail in Coos Bay. We launched at the ramp in Charleston, which is just inside the harbor entrance. Wind was around 6 – 8 mph and we had a wonderful time reaching across the bay and out to the channel buoy. 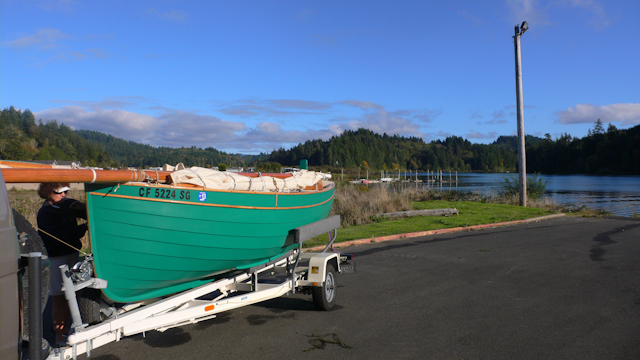 Just north of Coos Bay on US 101 is Lakeside, and Tenmile Lake. An excellent launch ramp is located in Lakeside. 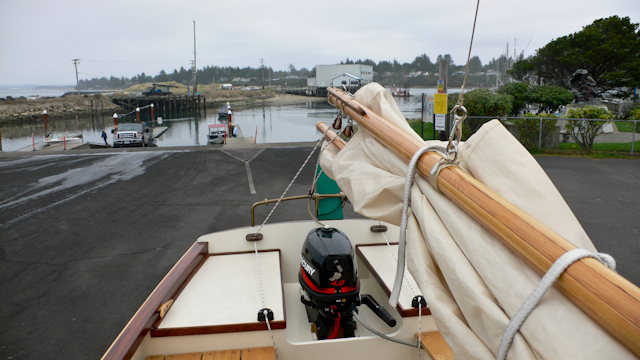 We had about 1 hour of 4 mph wind, but it eventually died out and we motored back to the dock. Part of our trip included a visit with a long lost friend from Bremerton WA. 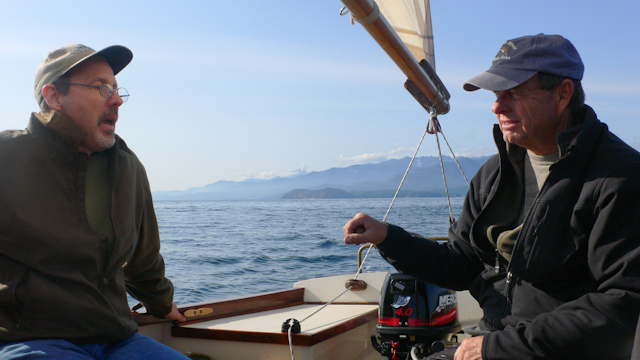 Here Dean and I are having a conversation on the Hood Canal. The winds were light but the scenery was spectacular. Dean keeps Alice Gale near the ramp while I get the trailer. 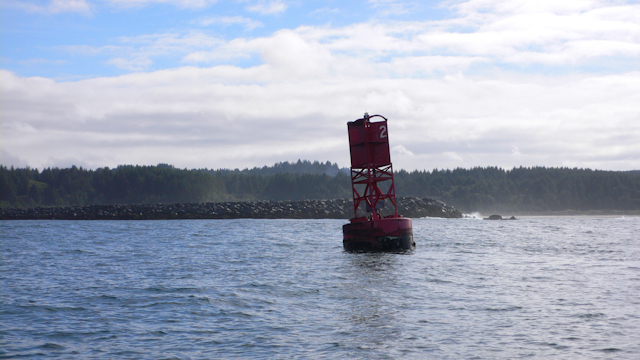 The launch ramp on Misery point, (near Seabeck, WA) was a shallow water ramp that required my trailer extension. It worked pretty well considering I still needed to almost bury the rear wheel of the Sportsmobile. Dean was of great assistance here. He brought along some hip waders, and had no problem getting into the water to help. The picture above also points out a construction flaw on my part that I have partially corrected. As you can see from this photo, I still have an excessive amount of mast rake. After my maiden voyage I realized I did not cut my mast partner sufficiently deep and my mast had the incorrect rake. I increased the depth of my mast partner cutout before this trip and found an improvement in the balance of the sails. I plan on again increasing my mast partner cutout to bring the mast forward and reduce the rake to about the 4 degrees as specified by the designer. Currently I have a comfortable amount of weather helm that seems perfect in light winds, but has considerable more weather helm when the breeze increases. 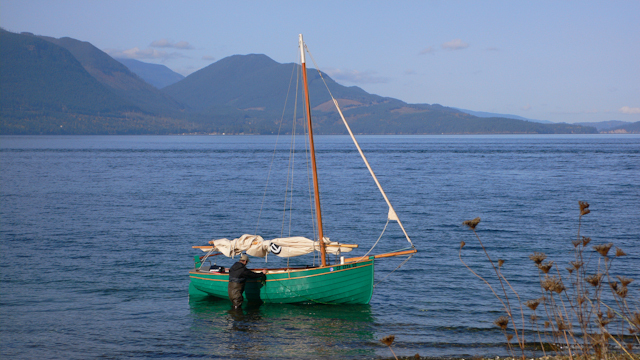 Moving the rake forward will improve my heavier weather sailing trim. 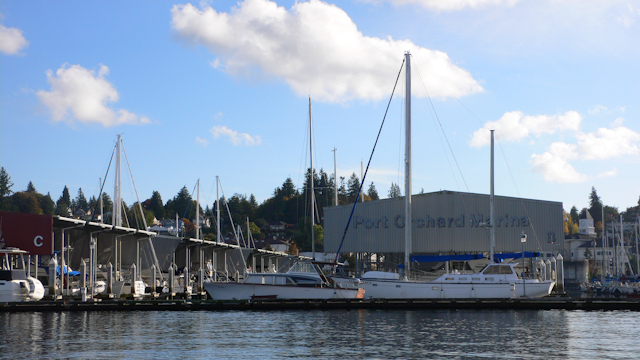 We also spend a few days with calm winds on Puget Sound and Lake Washington. These days became half sailing, drifting, and half motor sailing. 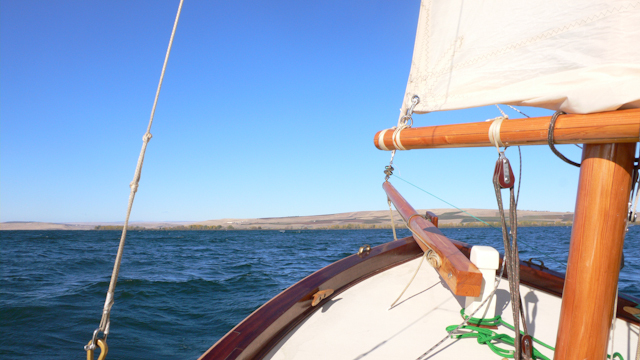 Our last sailing day on this trip was a short one on the Columbia River. Temperatures had dropped to about 40 degrees and the wind was around 15 with predicted gust to 35. The wind had been blowing all night for a 150 miles directly up the river so the wave action and wave period made sailing a challenge for me. 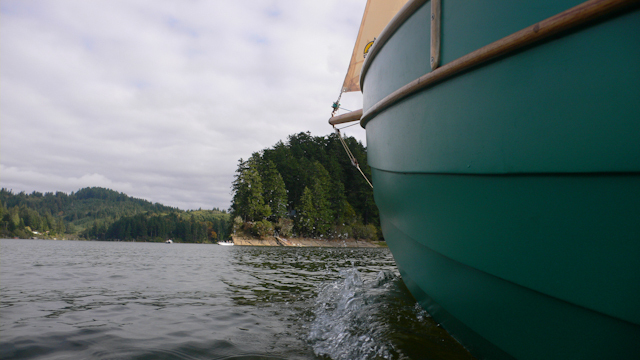 I am still learning to be comfortable when rougher water affects the balance of Alice Gale. I know she is more comfortable then I am, but the last thing I needed was capsize training in uncomfortable weather conditions. We went out with just the main sail with one reef tied to test the conditions. 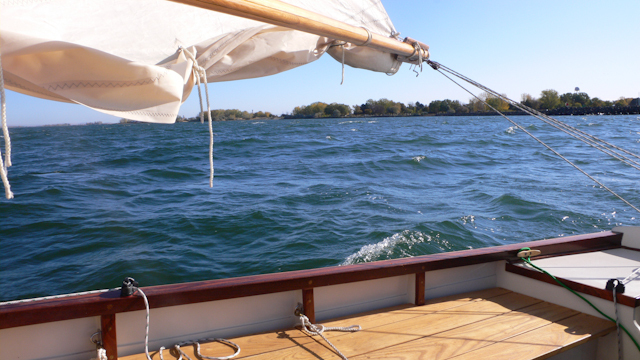 The wind was agreeable under this sail configuration but the wave action on the boat was not reassuring. The boat is certainly a dry boat, as we immediately popped out of any larger wave trough before any wave broke over the bow. There seems to be no plowing through waves with Alice Gale, she is a cork on the water and a little unsettling as she bobs up and down and back and forth mirroring whatever wave action is present. A longer and larger draft boat would of course be more stable under these conditions. I am wondering if a bit more ballast would help Alice Gale when the water is unstable. The slightly larger Ebihen 16 design calls for a water ballast system so this would seem useful at times also with the Ebihen 15. I have had her out on the ocean with 2-4 ft swells with a sufficient period between the swells to be comfortable, but these short period wind swells on the river just made the ride uncomfortable. The wave period was about the length of Alice Gale so every wave had an impact on the balance. In contrast, after arriving back in Southern California, I took my 80 year old dad out for a sail in Alamitos Bay. No wave action but a solid consistent 12 mph wind. What a great sail we had on all points. Gybing was fun, and we embarrassed the skipper of a West Wight Potter on a reach back to the dock. His trim looked perfect for the conditions but we passed him like he was standing still. I know the Potter is a slow boat but it was the first similarly sized boat (15 ft) I have been in contact with to compare boat speeds. Usually I am up against 20 ft keel boats that have out pointed me upwind, while I seem to almost hold my own running with them on a broad reach. Another boat we ran into was a 18 ft racing dingy with Spinnaker and planing hull that was practicing a typical course race with a single skipper on board. I was impressed on how quickly he was able to set his spinnaker and round the marks. She clearly was quicker then Alice Gale overall, but I was still impressed with how well Alice Gale did. The speed difference was not immediately noticeable and I was able with concentration to maintain comparable speeds on several tacks with him. Not bad for a Balanced Lug. Here is a slide show of our trip up north. Great way to see the sights we never take in while tethered to road travel. Glad you had a safe trip and hope to see you two soon.